"Die Erde ist wahrhaftig schoen und keinem zu verdenken, wenn er so lang wie moeglich darauf bleiben will. Gott sei's gedankt, ich fuehle mich so frisch und wohl wie je und waere bald zu tausend Dingen aufgelegt, die denn auch alle nacheinander an die Reihe kommen sollen, wie nur mein neues Werk vollendet und aufgefuehrt sein wird. Wieviel ist draussen in der Welt und wieviel daheim, Merkwuerdiges und Schoenes, das ich noch gar nicht kenne, an Wunderwerken der Natur, an Wissenschaften, Kuensten und nuetzlichen Gewerben! Der schwarze Koehlerbube dort bei seinem Meiler weiss dir von manchen Sachen auf ein Haar so viel Bescheid wie ich, da doch ein Sinn und ein Verlangen in mir waere, auch einen Blick in dies und jens zu tun, das eben nicht zu meinem naechsten Kram gehoert." 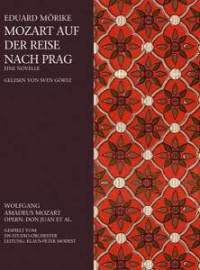 Summary: The novella describes a day in Mozart's life, but not just any day. For the opening of Don Giovanni, Mozart is on the way to Prague with his wife. On the way, he is caught trying to steal an orange from a garden of a stately home. When the family finds out that their 'trespasser' is, in fact, the great composer, the delightedly invite him to be the guest of honour at their daughter's wedding. My thoughts: The book is beautifully written. I love that story has so little to do with music, but tells us so much about Mozart himself. Another thing I love is that it's just a small story, not an attempt at a novel; it has all the right elements in the right amount - a little more would have spoiled the book. The writer never strays from the matter at hand. Mozart's thoughts and views about life, the forest and so on, are definitely worth a read. I mean, really, what could go wrong with a story about Mozart stealing fruits from a farmer!! I'd recommend this novella in a heartbeat. I'm reading this as well for next week and think it's a wonderful little book. It's cheerful but alos melancholic. From all I know about Mozart, Mörike captures him very well. I didn't know much about Mozart when I read this; but I read up on him a lot after in the past couple of days, and I do agree with you! Wonderful review, Priya! I read 'Mozart goes to Prague' last year and loved it. Glad to know that you liked the book so much! Vishy - Thanks, it's a very special book, don't you think? Very unique; I loved the idea of Mozart stealing and getting caught, when I read the blurb, and the novella was just as nice as it seemed!